Switch up the mood in your next campaign with this classic item. The clear, 24 oz. 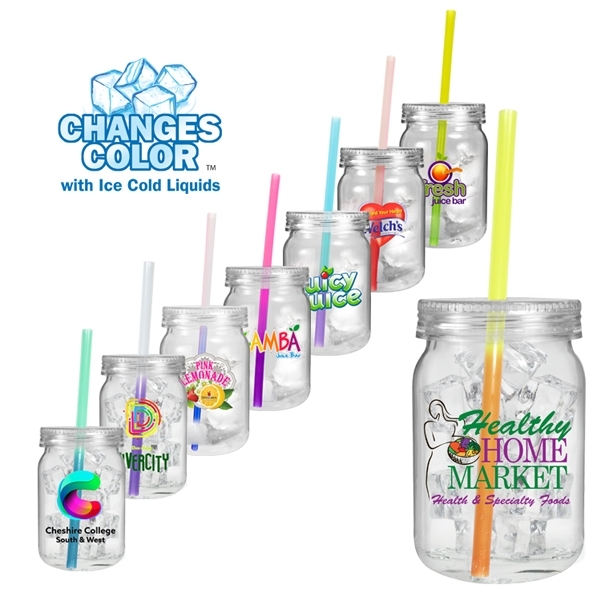 Plastic Mason Jar is BPA free and features a single wall design with a clear lid and an unimprinted heavy duty plastic mood straw. This colorful straw changes color with ice cold liquids. With full color process imprinting available, add your company name or logo and hand out this fun promotional giveaway at bars, restaurants or parties. Order yours today! Size: 5.8125 " x 3 "